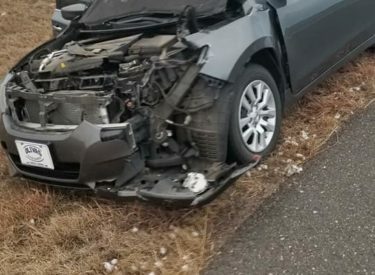 On December 18th at approximately 8:00am the Seward County Sheriff Office, Seward County EMS and Fire Rescue responded to a Vehicle vs Deer accident on Hwy 51 ½ mile East from County Road D. James Lackey from Moscow was traveling East on Hwy 51 when a deer moving South from the North ditch, jumped out onto the highway. Lackey struck the deer causing disabling damage to the front of his 2016 Nissan. The deer went over the top of the vehicle and landed in the rear window. Lackey was transported to SWMC with minor injuries.